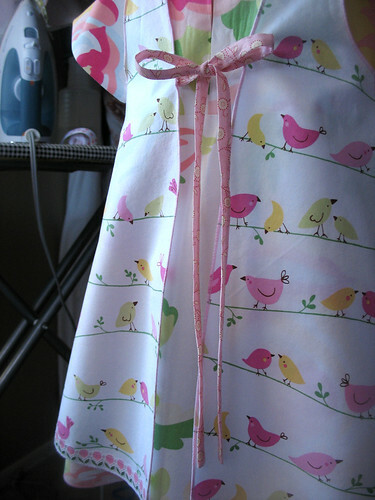 Another favorite do-hickie type thing - Stop staring and start sewing! I love my little Turn-it-All so much I keep it right next to my sewing machine at all times. It's the perfect tool for turning tubes. I bought it after looking at it for years thinking "hmm...I should try that". After one use I kicked myself for waiting so long to buy it. It saves me so much time and frustration. I had been using safety pins to try to scrunch the fabric through or poking a chopstick in the closed end and trying to "carefully" shove it through. 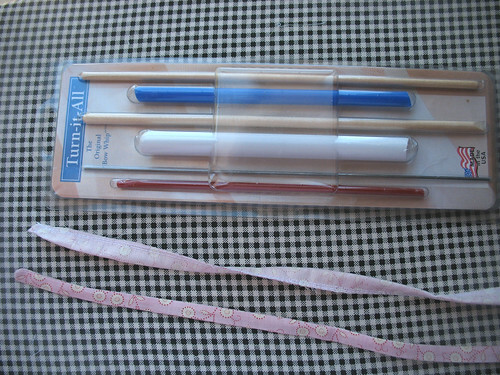 Here's what the kit looks like and here are a pair of before and after ties. It's only around 10.00 (which is why I was kicking myself for waiting so long to get it) and you can always use a coupon if you go to JoAnn. It has 3 different sizes and the fabric ties I turned today were pretty small (about 3/8 inch across, finished). It's real simple. 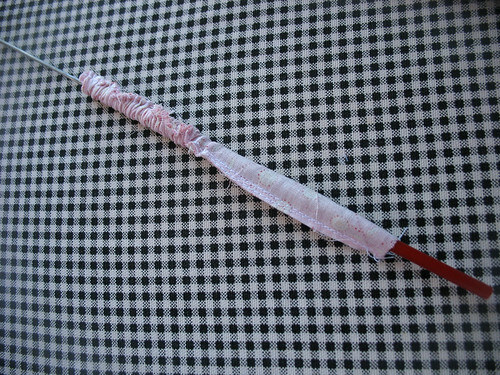 You just put the plastic tube piece inside your fabric tube and then poke the rod through the tube, taking the fabric through with it. 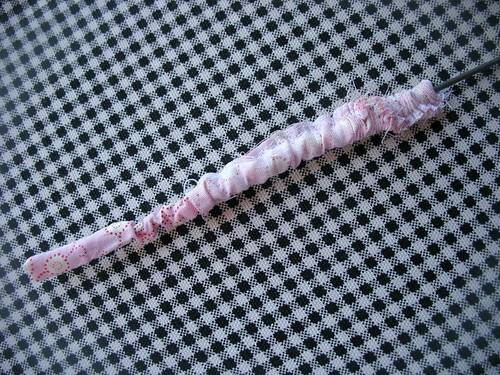 Once you get it most of the way through, you can pull out the plastic tube and pull the fabric all the way down the rod. Then you can carefully poke out your corners with it.